The condo front has been pretty quiet so I thought I’d highlight some of the new apartment developments coming up in the downtown area. A number of the apartment projects rival the scale, amenities and upper-end finishes of new condominiums. Other: Under construction, Green built, 11th floor amenities (fitness center, library, club room, conference room, media room, outdoor BBQ, fire pit and gardens). 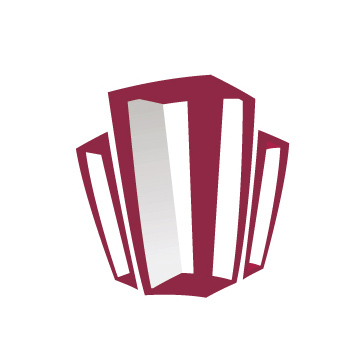 Other: Aiming for LEED Silver. Security developed the Epicenter in Fremont and is currently developing the Park in Ballard project at the old QFC site on 24th. 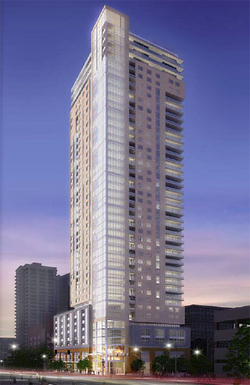 Security is also planning another high-rise residential tower at 815 Pine. Other: Project may include a hotel. 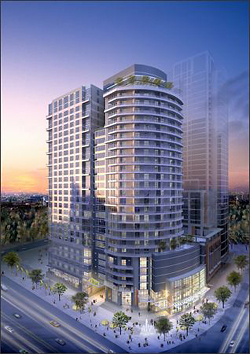 Lexas is currently developing the Escala Condominium. Other: This one has been around for awhile. Other: Essentially, located South of Mosler Lofts. Other: Adjacent to the Olympic Sculpture Park. 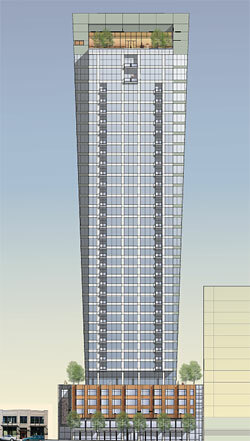 Other: Part of the Hyatt Place Hotel complex, originally proposed as condos. Other: Occupancy expected for Summer 2008. 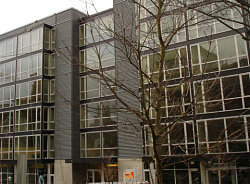 Project originally developed as condos but converted to apartments during construction. 2 projects on here that I thought were headed for Condos: the 2nd and Virginia towers, and the OSP adjacent one. When did those switch over? 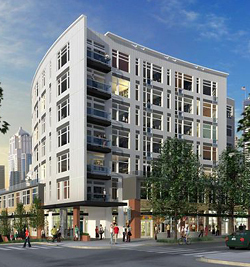 Also, another project I didn’t see on here was the 1915 2nd ave project. You can see it in the far right of the 2nd and virginia picture, its. I always thought that one was cool because it had the huge pine tree peaking through the hole in its roof. Is that project still going forward? Matt – I’ve heard conflicting info. Back in September I mentioned the 2nd & Virginia towers were condos then I heard otherwise…but I can’t find that source. 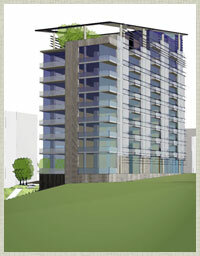 A couple of weeks ago the Seattle Times did refer to the projects as condos so will go with that for now. I’ve since removed the projects from this post. Thanks for the heads up. As far as the 1915 2nd project…I’ve asked for status updates from Intracorp but they remain mum on the subject. Given the Expo 62 and Domaine issues I’m guessing this project isn’t a high priority. Though, the 1915 2nd project would appeal to a different buyer demographic so who knows. Thanks for that summary, I sometimes forget how many rental properties are going up around town. It’s outnumbering condos now! fyi, the architect for Olivian is Carrier Johnson, not CollinsWoerman. I’m guessing that approximately zero of these new units will be affordable for middle to low income renters. There’s only so many $60k jobs at Google or Amazon to go around! Where are all of the service/support workers (doormen, security, maintenance, servers, etc) needed for this new infrastructure supposed to live? City planners appear to be hell-bent on turning this town into another San Francisco. Jeff – you’re spot on. 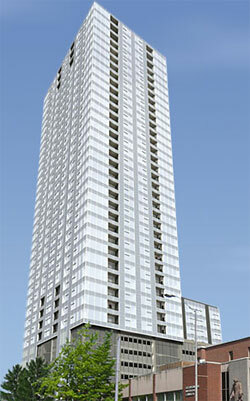 I didn’t include the Borealis (Denny and Dexter) which is being constructed as an affordable rental property by Vulcan. But, that’s pretty much it. Wrong Jeff. Zoning for highrises requires affordable -or lumpsum payment to city in lieu of. Youre right about SF type scenario though. I’m more worried about middle class -college educated singles who want to live downtown can’t afford it and they’re the demographic the city wants. 1915 2nd avenue is no longer is profiled on the Weber+Thompson website. Likely toast. That pit at 2nd and pike may welcome the fall of more than one tower as the recession swings it’s doleful scythe. 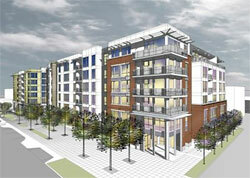 There is one new apartment building not mentioned that I would like to add- Westlake Village. 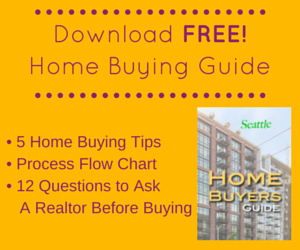 Although the property is not downtown, it is close enought to walk to Belltown in under ten minutes. The view at this property is incredibile! 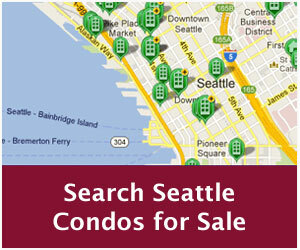 Westlake Village is right next to Lake Union with a beautiful backdrop of Capitol Hill and downtown Seattle. Why can’t the “…service/support workers (doormen, security, maintenance, servers, etc) needed for this new infrastructure…” live in buildings like the income-restricted Lowman Building (completely renovated in 2005) or the brand-new Quintessa, among many others? The people on the “no low-income housing options available” band wagon need to take a look around before they spout off. I actually live in the Lowman Building right now, and there isn’t a line of “doormen, security, maintenance, servers” waiting to get in. 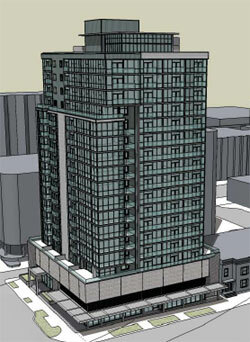 I hope design review isn’t finished with 1200 Stewart. 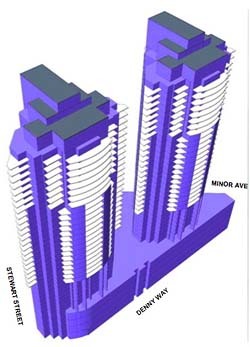 As we’re beginning to see at the Escala, these buildings may be more appropriate for Vegas, not Seattle. I lived in a Seattle apartment and wrote this lovely rap song… enjoy friends!